This week I celebrated my 43rd Wedding Anniversary, getting married at the end of March to claim back our tax paid that financial year. In those days you could also offset one third of your mortgage interest against tax, as an incentive to get on the housing ladder and we had scraped together enough for a deposit to begin married life in a house without furniture. With nothing left for a honeymoon, a day at the Ideal Home Exhibition had to do. A delayed honeymoon was planned for later, a week in a cottage on the banks of the West Lyn in Devon. Two 8 ft 6 in glass Shakespeare fly rods were bought and being an instrument maker with an understanding foreman, I machined up a pair of light weight aluminium fly reels, these fitted with McHardy’s mill end lines. 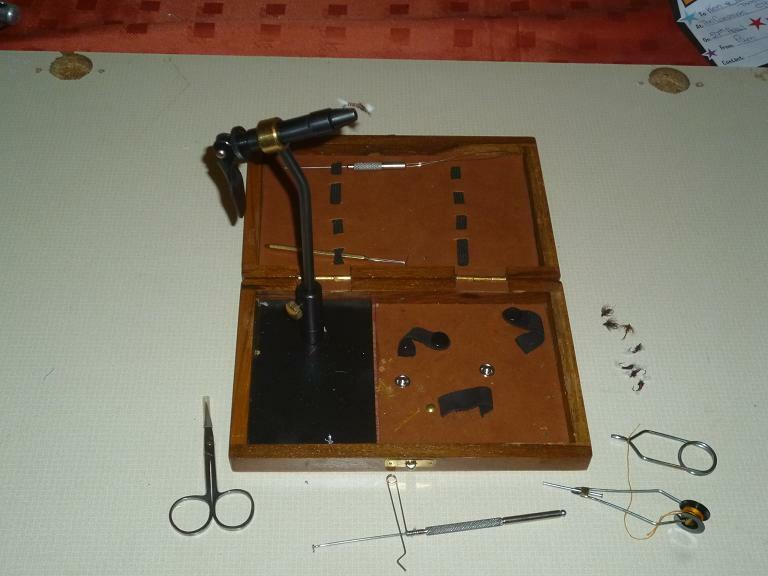 Flies were too expensive to lose, so I made up a simple set of tools, a freestanding vice, bobbin holder, hackle pliers and dubbing needle, all copied from the McHardy catalogue and set about teaching myself to tie flies. 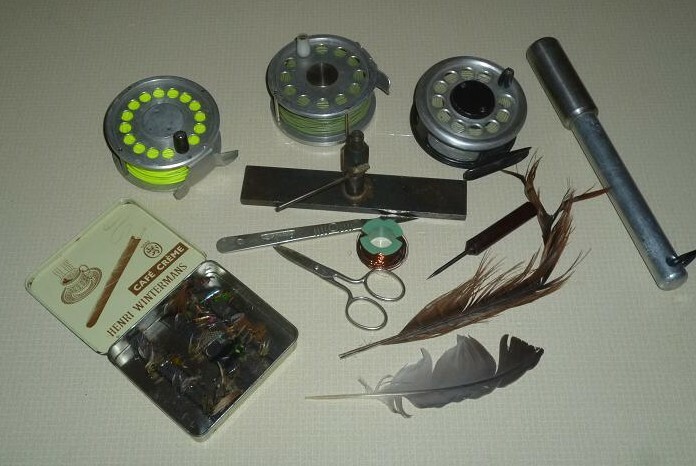 Small, sparse, winged, wet flies were needed for the Lyn and with pheasant wings and tails available from shooting, along with wool pulled from the jumpers of workmates, for dubbing and milk tops for tinsel, I was soon turning out reasonable copies of flies on show, courtesy of McHardy. I made a copy of a whip finish tool, but without YouTube, I had no idea how it worked, so never used it, but with good eyes and deft fingers, whip finishes became second nature by hand. My fly box was a cigar tin with strips of rubber glued in. My foreman had a saying “Butchers don’t buy meat”, which we applied to anything that we could make. That holiday was memorable. A half hour searching out the pools of the West Lyn next to the cottage, would provide breakfast of trout on toast, followed by a visit from a holiday cat, that would wait at the door for the left overs. Days were spent fishing the tumbling rivers Lyn and Heddon. Being pocket waters, my young wife became expert at casting to these, hooking and landing some nice browns, along with young sea trout, although being very girlie and blonde, she never mastered the technique of taking them off the hook. No sooner would I return to my rod, than she would land another for unhooking. Casting up to the heads of the pockets, those early wet fly imitations worked well, many of the trout hooking themselves in the fast flowing runs. 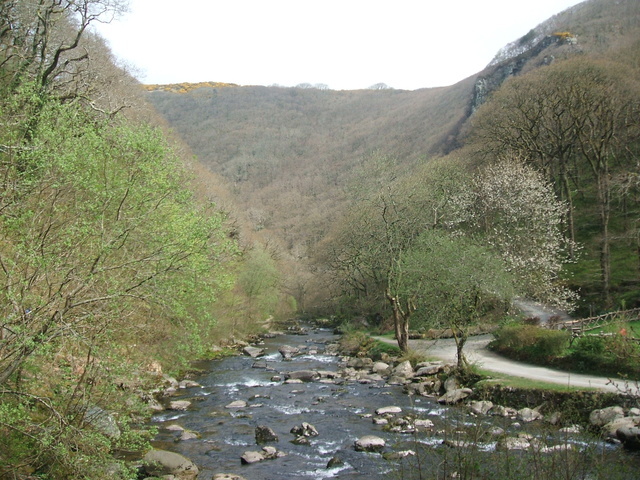 We have visited Lynmouth and fished it’s rivers many times, always finding something new each visit, the winter floods creating pools and changing others, while some are now out of reach, the ability to leap from rock to rock, long gone from our legs. In the same light, it was time to finally give up on my home made flytying tools and accept the gift of a boxed kit for Christmas. 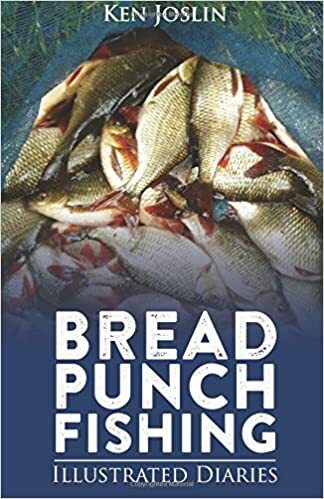 This meant visits to YouTube to learn how to use whip finish and dubbing tools earlier this year to create some new still water lures for rainbow trout, my old McHardy catalogue now superceded by the Internet. With the trout season looming, it was time to open up the new box of tricks and produce a few tried and tested old favourites, some of which had become a challenge in recent years, but were now back on the agenda. 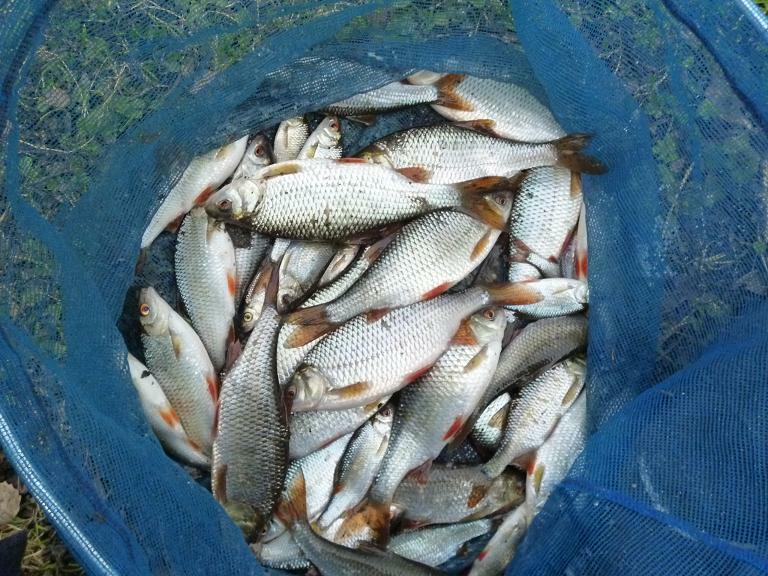 Chub hunting, the thin and thick end of my season. The last day of the season dawned with one of the hardest frosts of the year, but bright sunshine had soon thawed the white from the grass and left me feeling optimistic for an end of season chub bonanza from my little river. A mile out of town, it’s course brings the river out from private land at the bend in a road, scouring a channel in the gravel as it turns sharp right, before heading off into impenetrable undergrowth. I have driven by this spot many times, but never fished it and was on my “one day I’ll fish it” list. I was expecting great things from this swim and tackled up a 14 ft rod with a stick float rig, 5lb line to 3lb link and a size 14 barbless hook. There were plenty of snags and with the shallows dropping away to a deep pool, there could be decent chub, or even a common carp to wrestle from the high bank. A couple of balls of crumb were dropped into the channel and a further two towards the tree shrouded tail, where a log was jammed between the banks. My heart was beating faster as the first pinch of flake was drifted down towards the log, the float dipped a couple of times, but nothing to strike at. I held the float at the log, another dip and missed. More flake, more missed bites. I thought I saw a flash of silver on the shallows below me and dropped the float in, only for the bread to disappear and the float to lift sideways as a small 8 oz chub fought for all it was worth, the long rod giving me the leverage to keep it out of danger. This was a very lean fish and for it’s length, I would have expected another four ounces. It had obviously been a hard winter. I dropped into the same spot and away the float went again, this time from a much stronger chub, taking me along both banks, before it’s mouth gaped ready for the net. Yet again very lean, about 12 oz. Ready for another I tried again, but that was it. Easing the flake down over depth produce more pulls, but no fish, until I punched a 6 mm pellet from the thick slice and up popped a gudgeon, then another. I’d only been fishing for an hour and decided load up the gear and give the park another go, at least the mums keep them well fed with bread. 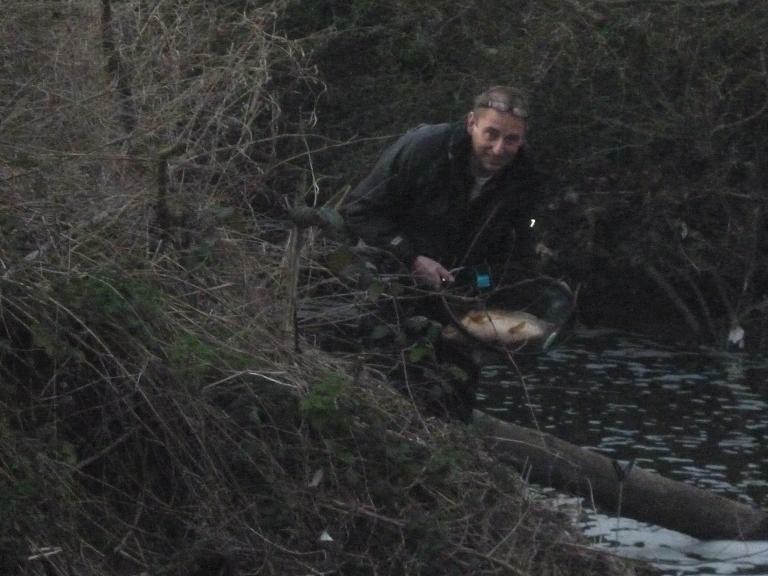 At the park I set off to another of my “one day” swims, a tunnel of overhanging branches, where the river narrows to push the flow through a no-go area of snags, but with this tackle I was confident of success. I didn’t have to wait long, the float going down just as it entered the danger zone and the rod responding with a healthy bend as I pulled the chub upstream. 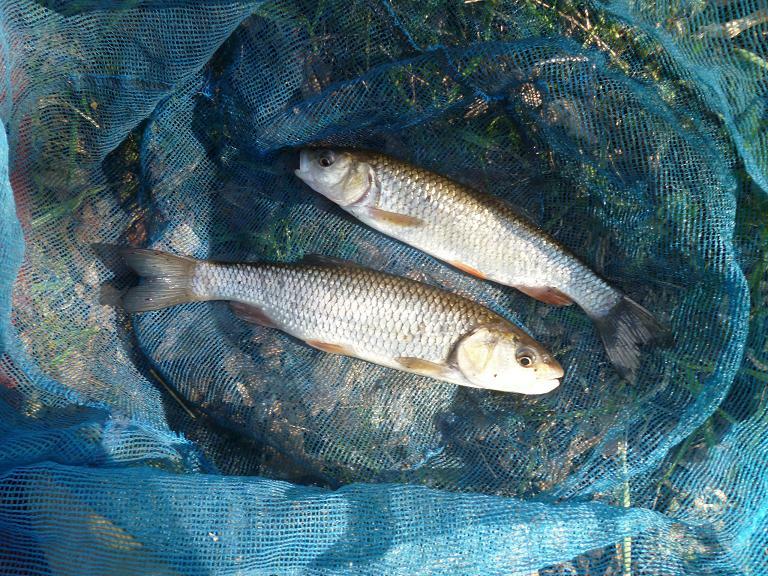 These chub go mad in this shallow water, making long runs towards whatever snag is nearest. 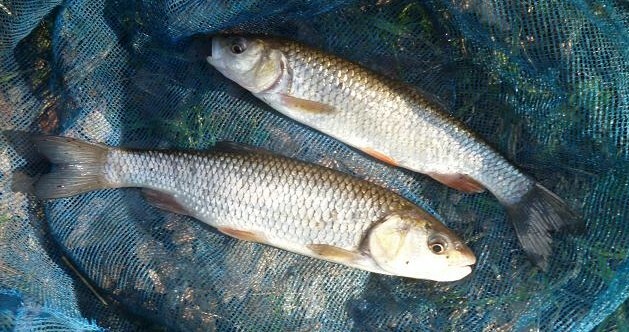 A fat pound chub was soon in the net, contrasting with the two taken earlier. `Dropping further into the trees brought a pair of roach, before a tentative nibble and a slow sink set the world alight as the best chub I’d hooked from this stretch buried it’s head under a pile of flood debris, snagging me. 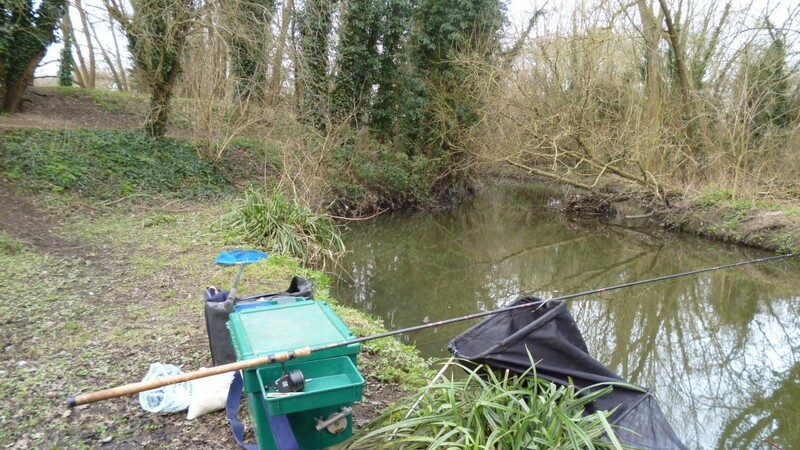 Steady pressure brought the fish out, but a branch was still wrapped round the line and I watched it Vee upstream towards a sunken supermarket trolley festooned with branches, turning it in time for the possible three pound chub to rush off back downstream. This was like a frantic game of tennis, with the powerful fish charging all over, me putting on counterstrain in an effort to wear it down. At last it’s gaping mouth came out and I got the net out to land it, but the branch was still attached to the line and as I drew the chub towards the net, the branch caught in it. 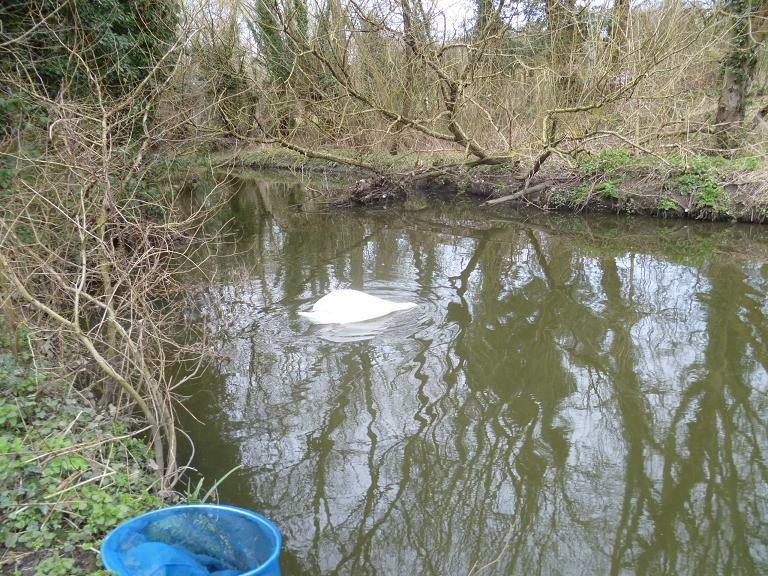 This was a signal for the chub to thrash around outside the rim and now in a state of near panic, I dragged the lot in, the fish diving under the bank, with me trying to net it out, but the branch kept it away. Suddenly it was gone and I was left staring at the empty net. I laced the water with a few more balls of bread and inspected my line. The hook link had broken at the spade end and I resigned myself to try again as I whipped on another hook. 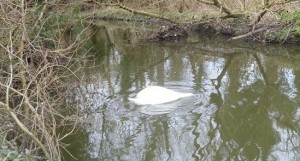 As if fitted with radar, a swan appeared round the corner and made a b-line for my swim, searching out the bottom with it’s neck outstreched. Bread was now beginning to drift downstream with yet another mum feeding the ducks and the swan followed the trail, while I trotted through again hooking more small roach and the odd gudgeon. 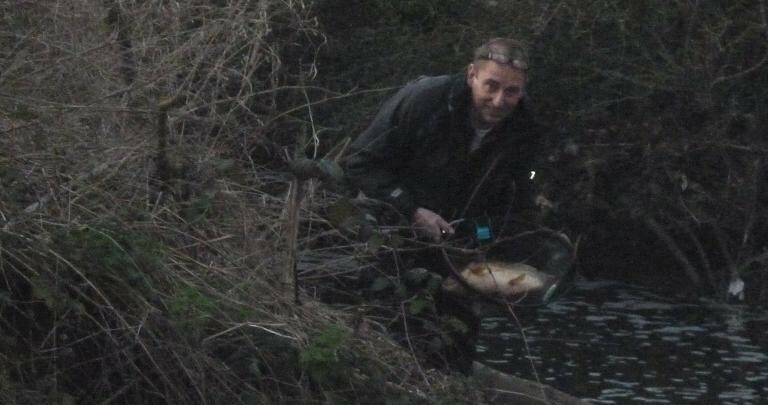 The commotion had probabaly put down any more decent fish, so cut my losses again, with the season ticking to a close. 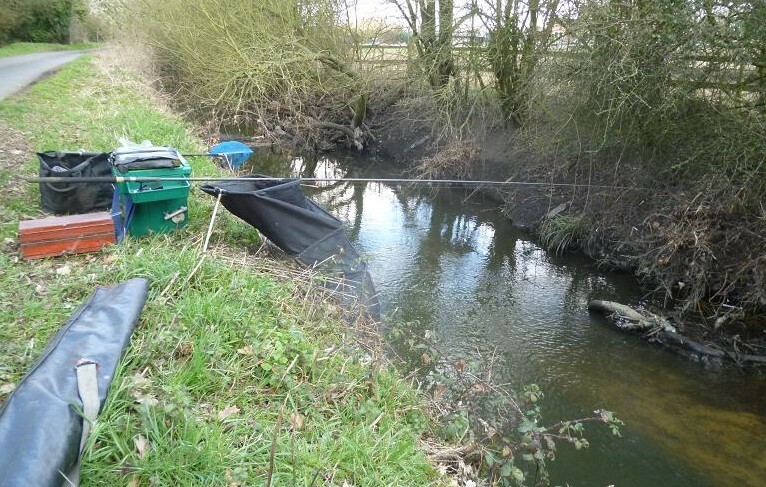 I was travelling light anyway, with just my rod, bag and nets, so made my way downstream to another chubby spot, only to find an ivy strangled tree had crashed down rendering the bank unfishable. This part of the park has been left unmaintained and many of the trees are in a dangerous condition, but continuing down found a bit of bank cleared by another fallen tree. This was on the inside of a bend with muddy shallows giving way to a far bank trot round the curve. 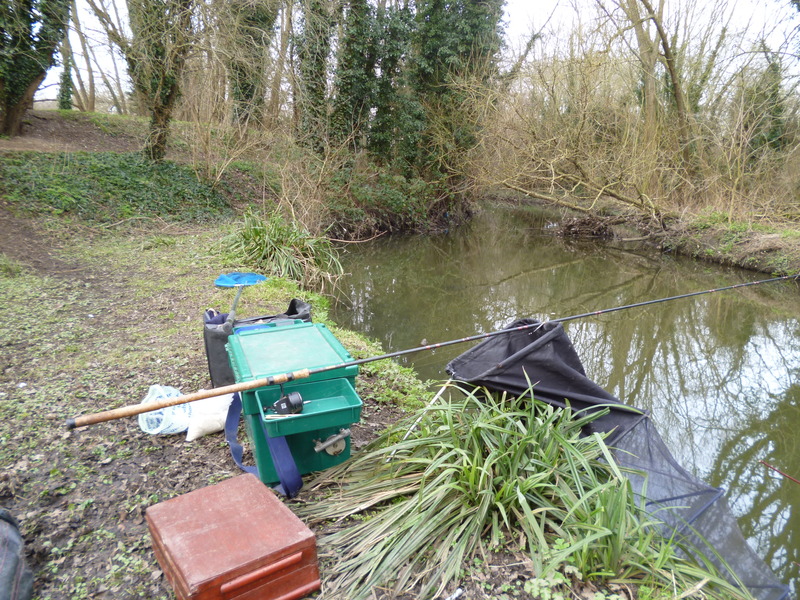 It was greedy to hope for another big chub, but the tangled far bank looked up to the job and with the last of my crumb, fed over to the deeper water. The first few passes yielded nothing and I deepened up six inches, holding back, then letting it run, tap,tap, sink, big gudgeon, one a chuck, then whomp, a chub hooked it’self as I held it back on the edge of the shallows. Back-winding I held the first lightning spurts of power, before getting the upper hand and with snag free water brought it across the shallows to the net. 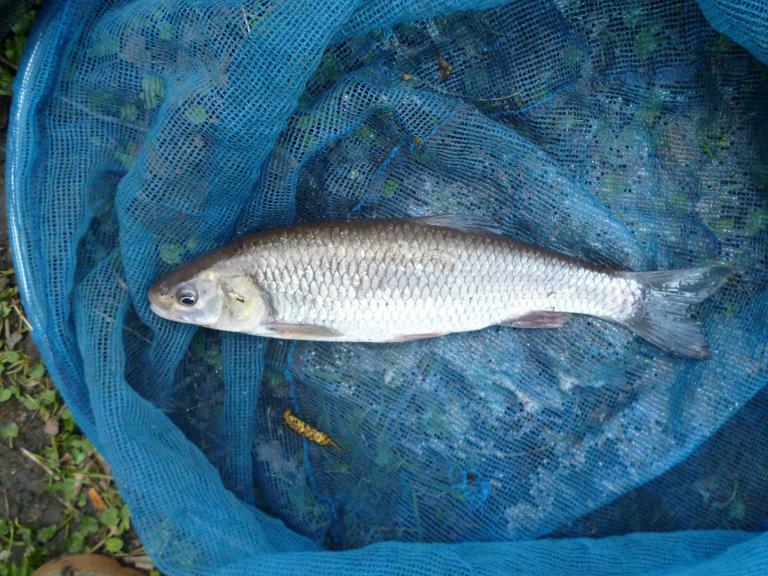 This was another round, plump chub of about a pound, more roach shaped and yet again fought hard in the cold, clear river. 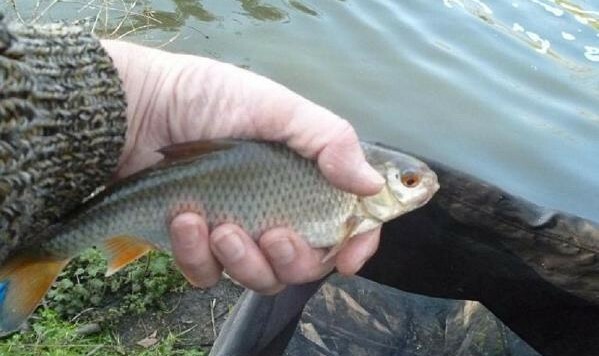 That was my last chub of the season and I continued catching the voracious gudgeon, the bites being so predictable that it was cast, tap, tap, lift and reel in. My time limit was 4 pm and made my way back to the van, watching a kingfisher as it skimmed between the trees along the river. A good sign for next season. 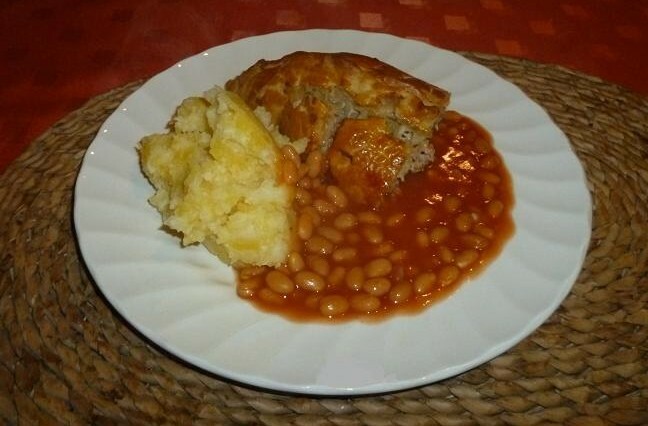 Pasties were the original convenience food, ideal for pinic, lunch, or dinner, hot, or cold and I have adapted the traditional recipe to suit the hunter. Put the flour into a bowl and sprinkle over the salt. Chop the butter into cubes and add to the bowl, squeezing the flour and butter together and mixing with your fingers, until a fine bread crumb texture is produced. Now add the water in stages to produce a dry ball shaped dough and cover. Put the potato, swede and carrot cubes in a saucepan, cover with water and parboil for eight minutes. Strain off and leave to cool. Place the onions and garlic in a frying pan with the olive oil and lightly fry them until softened. Leave to cool. Slice the meat, bacon and sausage and roughly mix, then with the large cutting plate fitted, feed into a meat grinder. This makes for a better mix of flavours. Sprinkle over the mixed herbs and Worcestershire sauce and stir into the mix. Season with salt and black pepper. Add the onions and vegetables and mix thoroughly with the meat mix. Divide the dough into two and roll out on a floured surface, flipping and turning until it is 3 to 4 mm thick. Using as a guide cut round a cereal bowl to produce a disc approx 170 mm dia. Repeat with all the dough, which should produce eight discs of pastry. Load two heaped table spoons of the mixture in an oval shape along the centre line of each disc and brush the edges with beaten egg. 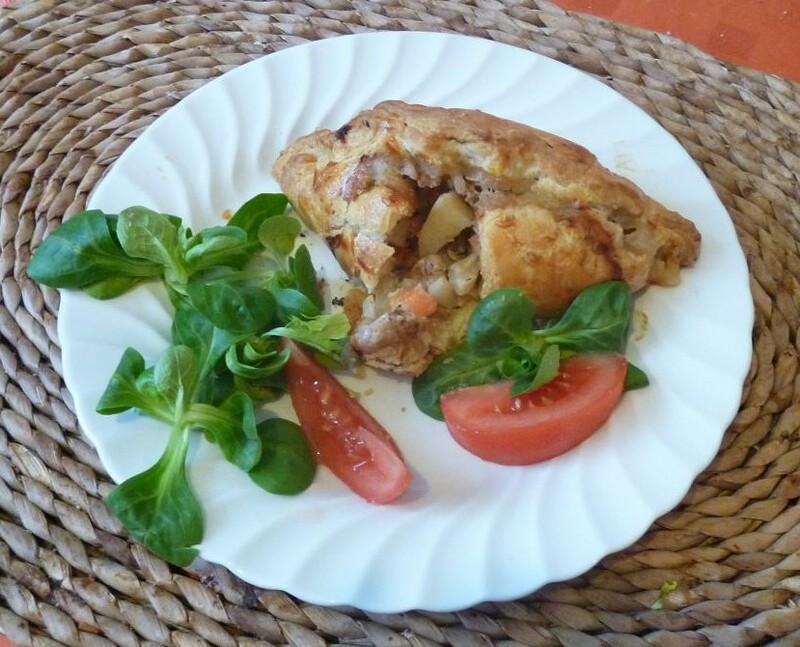 Draw the pastry up around the mix and crimp the pastry shut in a zig zag between your fingers. Brush over the upper surfaces with the beaten egg to give a glaze when cooked. If bacon, or cherizo is not used, then a knob of butter should be added at the top of each mix to aid cooking, as rabbit and pigeon breast have no natural fat. 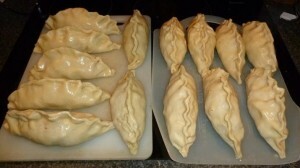 These are now ready to cook in a hot oven for 30 minutes until golden, or freeze for another day. Living in a town, it is easy to be fooled by a break in the clouds, thinking that it’s a lot warmer than it actually is. Central heating also has a hand in this, along with wishful thinking, which is why against my better judgement, I unlocked my gun cabinet and took out my CZ HMR for a drive to the edge of the Chiltern Hills. The permission is on reclaimed land high over a valley, where the farmer fattens cattle in the summer, but in early March it can be pretty bleak and as I drove up the steep lane to the yard, the wind was rocking the van and scudding clouds across the weak sun. Having climbed the gates, the concrete of the yard gave way to sucking mud, before ascending the hill along the barbed wire fence, which divides the 25 acres of grass bordered by scrubland. There were pools of standing water, as I made my way across to the vantage point of my stakeout position, where I have a view looking down 300 yards of undulating meadow, edged by brambles the other side of the wire. Keeping low with the rising ground behind me, the sight of white tails flashing back towards the edge, meant that the rabbits were still wary, despite giving this land a rest for over four months. 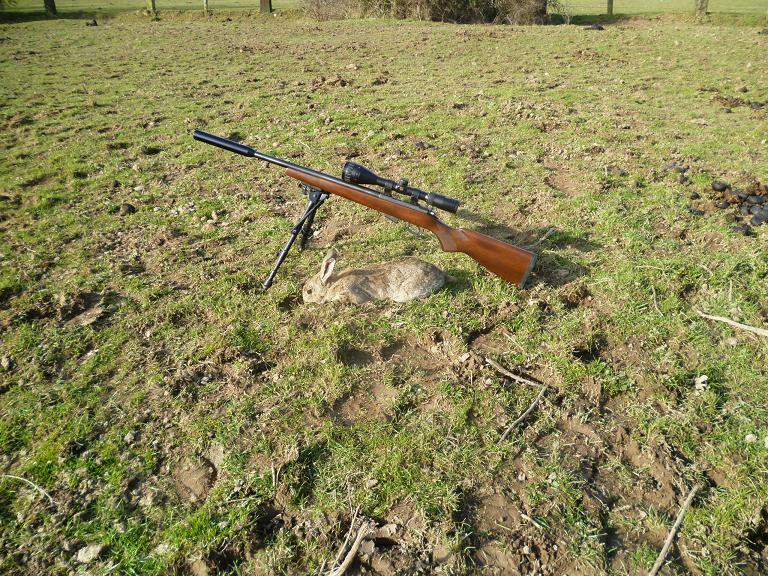 At least there were a few about and I settled the HMR on it’s bipod and scanned the scope along the wire looking for sitters, lying on the cammo net as a respite from the sodden ground. This time last year we were enjoying a mini heatwave and I had to take my heavy jacket off, as I was sweating after the uphill walk. Not so this time, inspite of the occasional bright sunshine, a north east wind was already biting through my layers, as I waited for any movement into the field. After ten minutes a rabbit stepped through the wire into the field and began feeding a hundred yards away. I put the scope on it and could see that it was facing away down the field with only it’s back on view. No good, I needed it to raise it’s head for a shot. I shoot for the meat and the HMR .17 ballistic bullet has a devastating effect on body organs, rendering it unfit to eat, when hit in the lower body. If it had been closer, a click of the tongue would have been enough to make the rabbit raise it’s head in curiosity, but now I had to wait with the cross hairs on the expected position. Another rabbit passed across my field of view and I looked up to see it five yards closer and facing me at an angle. 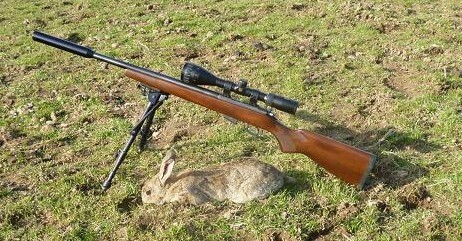 I swung the rifle round and got a bead on the new target, just as it hopped behind a rise in the ground with only it’s twitching ears visible. Back to the first and this one was following the other one. More waiting. A couple of very small kittens now began running around 25 yards away, one coming within twenty feet, before trotting back to it’s sibling. A third rabbit broke cover and joined the others feeding in the hollow, an area out of the biting gusts, unlike my exposed position, where the wind was behind me and creeping further into my jacket. A movement and a head raised from the hollow. The crack from the rifle barrel echoed back across the valley, joined by the thump of the head shot impact and the rabbit leapt in the air, while the others scurried back to safety. Snow flakes had been twisting in the wind since my arrival and as I went down to collect the healthy buck, clouds behind me were gathering to deliver more. With my prize cleaned and skinned, I continued the stakeout for another 15 minutes, by which time the snow had increased and was settling. Nothing was going to come out now, being almost blown back to the van, reflecting on last year’s first visit with eight rabbits weighing me down, but for today this one would have to do and had already decided it would go nicely with a pigeon breast into some homemade pasties. Rabbit and pigeon pasty with a hint of cherizo, served piping hot with swede potaoes and baked beans. Rubbish tip roach, after a change of plan. 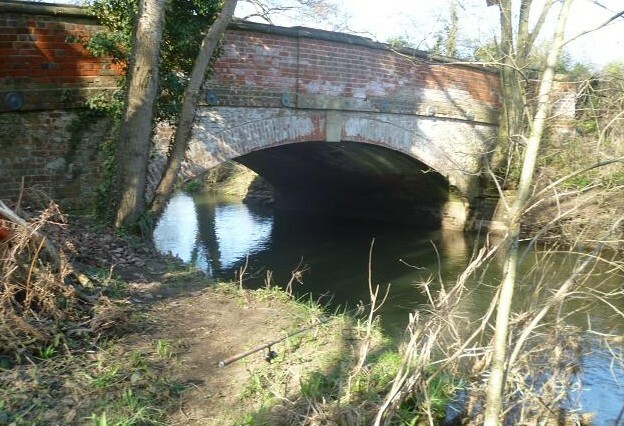 At a working party on my trout fishing water last Saturday, clearing debris from the recent floods, the river looked in perfect condition and I made a promise to myself to come back before the end of the coarse season, to fish for the chub living beneath the road bridge. The sun was hinting at the spring to come, when I climbed down the bank a few days later, armed with a mashed up white loaf and a few slices for flake. A 4BB bodied wire stem stick float, size 12 barbless hook and 5lb line would be needed to cope with the flow under the bridge, well up on when I’d seen the three and four pound fish sipping in flies under trees on the other side at the end of summer. I’d fed half of the crumb before my first bite, the float dragging under just as it went beneath the arch. 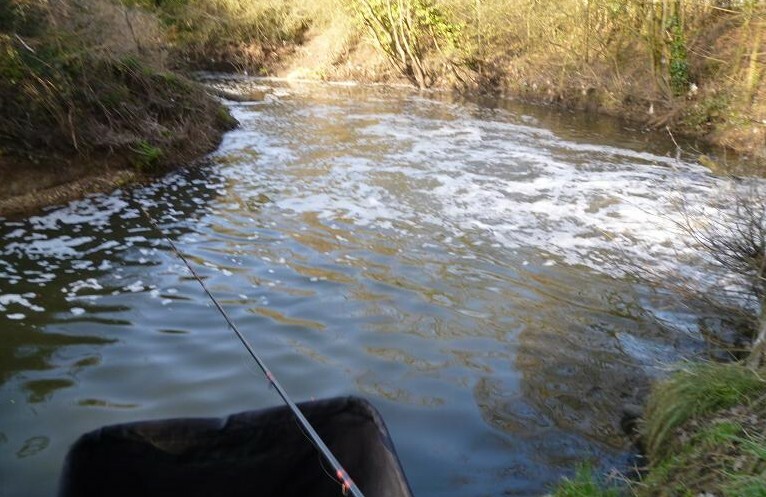 My mind said snag, but also knew that there was no snag there, as I’d made that trot twenty times already, the rod tip diving towards the river with the weight of a good chub as it kited off down stream, with me backwinding as little as I dared. I saw it’s golden flank flash in the sunlight, as it topped the other side of the bridge, then it was gone. Bother! The hook was OK and balled in more crumb, watching it split into particles as it was carried away. A couple more casts, the float dipped and a nice dace was fighting back, but no opposition on this tackle and I swung in the 6 oz fish. 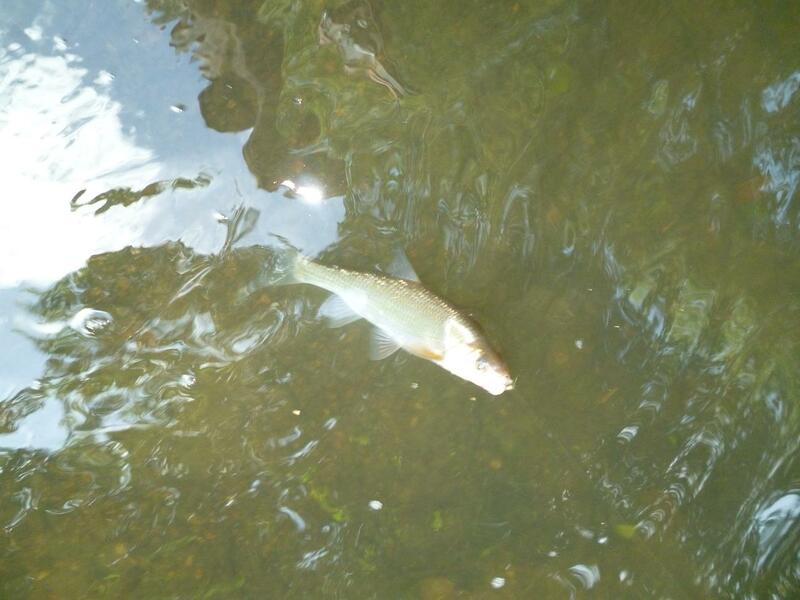 Then another chub on, smaller than the first, which stopped after a short run and began power surges towards the far bank, swimming upstream parallel to it, until it’s head came out and it drifted down towards me. Net out, it dived beneath it and made off upstream under my bank into the welcoming tangle of flood debris trapped by a small tree. I couldn’t believe I’d fallen for that sucker punch as the whole lot went solid, the chub was still there and I could feel it pulling back. I tried letting the line go slack, but the two pounder was long gone, when I finally gave up on it and pulled for a break, the 3 lb hook line cracking off and leaving my float wrapped in a tangle of line and shot. 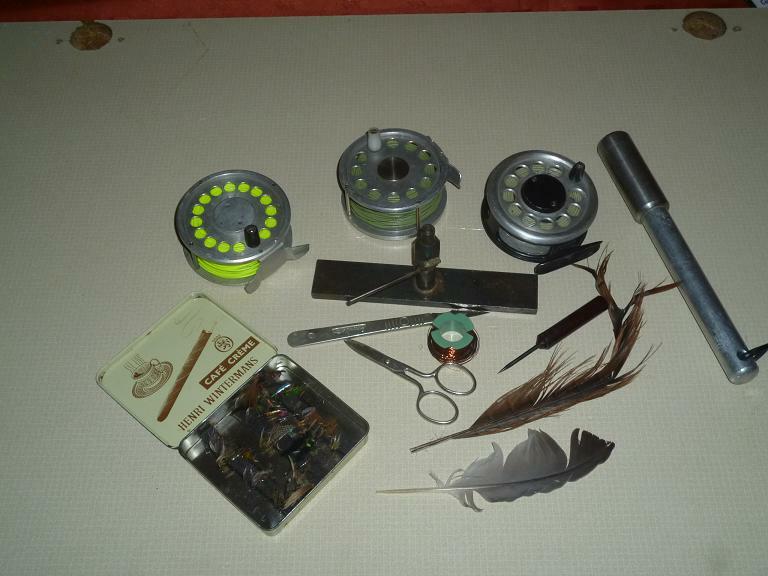 Travelling light, the float had been on a winder and I only had spare hook links. My tackle was in the van, parked in a layby a hundred yards up the road, it was still only 2 pm and I could get back, make up a new rig and be fishing in half an hour. By the time I reached the van, I’d changed my mind and decided to head back to town to fish my little urban river at a point where an outflow from the town’s water treatment works, floods over a weir to double it’s size, before it heads off into private, unfishable property. Last year I’d had roach to a pound and chub to three from this fast flowing section and been told of double figure carp, but not had one, so was pleased to see the swim next to the weir was empty, as I squeezed the van into the gateway next to it. 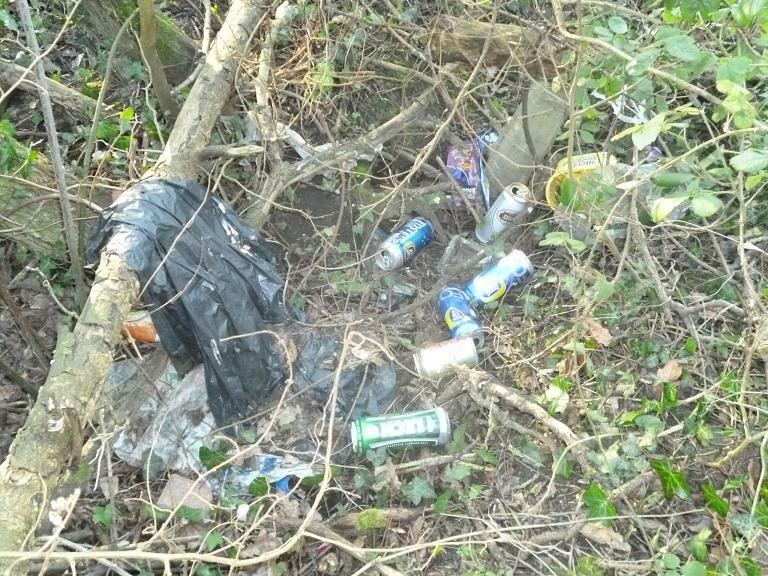 I’d not fished this swim all year and I could not believe the amount of rubbish left behind by other “anglers”, beer cans by the dozen, empty hook packets, plastic cups and containers, plus the inevitable empty sweetcorn tins. Yuk. 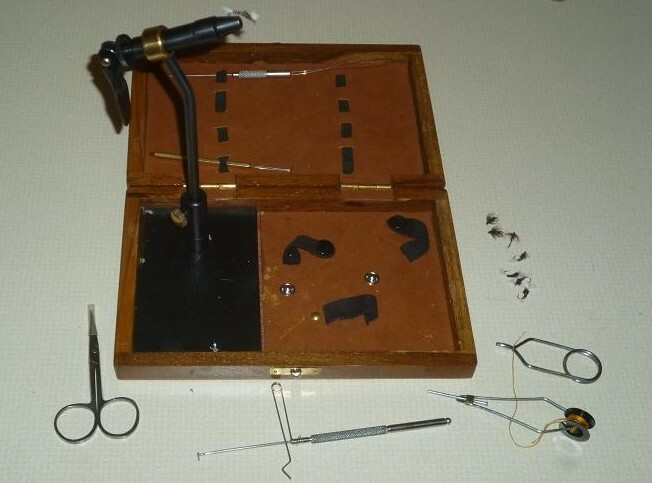 I removed a rod rest made from a broken branch, before setting up with a small 4 No 4 wire stem to size 14, this also being on a winder, my eyes not being what they were, it’s easy to just go loop to loop, once again to the 5 lb line. The river is only about 30 inches deep and the main river flows into the froth of the weir stream and usually catch at the crease. I punched a 7 mm pellet from the thick slice and fed the coarse crumb into the slower river in front of me, the float diving under first cast from a 2 oz rudd and wondered how many times this little fish had been caught, as most of it’s scales were missing. More scruffy rudd took, before the first of many good roach dashed off into the foam. 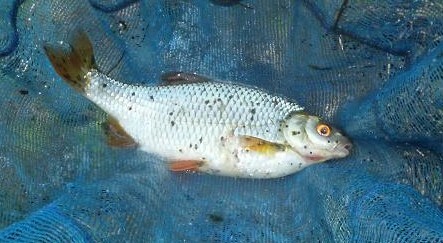 The best roach, a deep fish of 12 oz, was covered with raised black spots, some form of lice that I’ve not seen before. 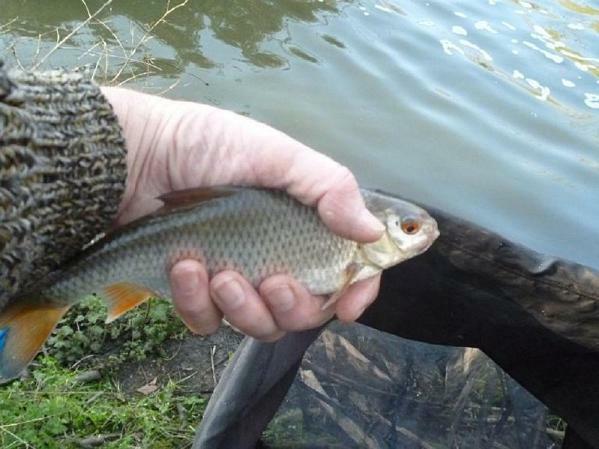 A lone 12 oz chub gave variety, it’s long runs in contrast to the thumping fight of the roach. 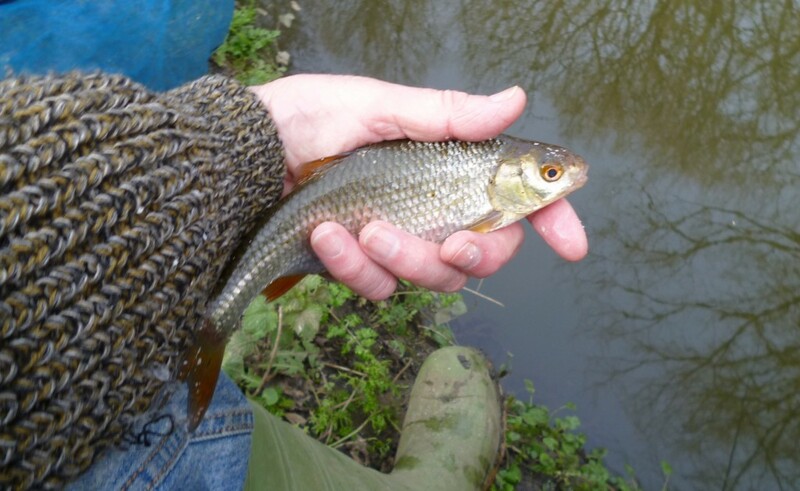 Another angler had begun fishing downstream, round the corner on the opposite bank, feeding maggots under a stick float and was soon catching roach, then a pound plus chub. As I was packing my gear, he gave a shout and I could see that he was into a very large fish, that snagged him, then ran upstream into the weir until it tired and dropped back down to his net. This common carp weighed in at 8 lb 8 oz and he had changed bait to a lump of cheese, held back on the stick, the first carp he’d had from the river and the first I’d seen. 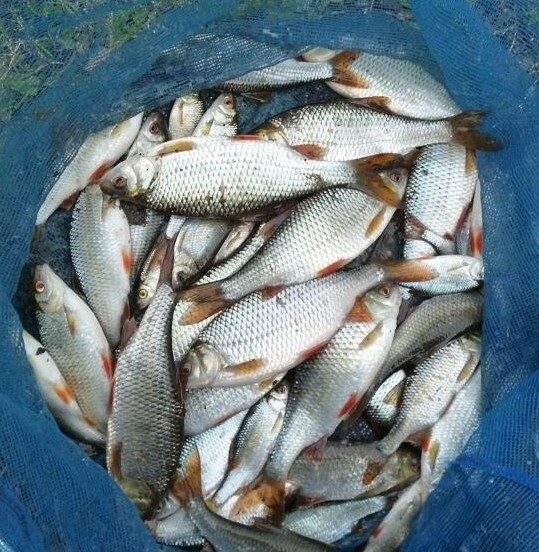 I’d hoped for a few more chub, but couldn’t complain about my change of venue, this probably being my last outing of the current season, finishing off with a net of quality roach, even if the surroundings gave a lot to be desired. 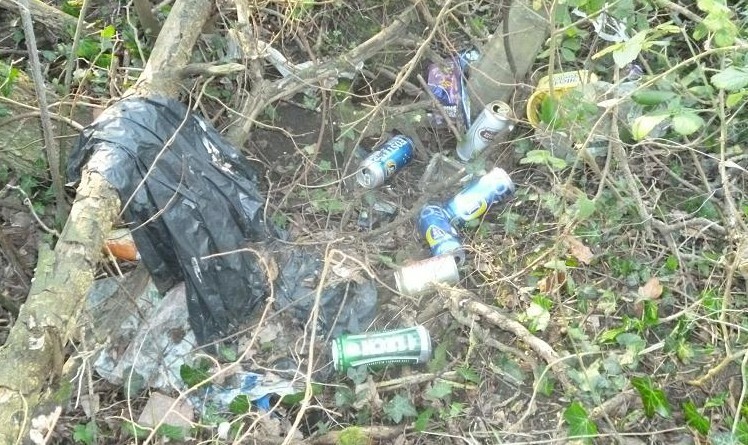 My last task of the day was to fill a couple of those discarded bin bags with other people’s rubbish. A sign of warmer weather, was the sight of brand new floats festooning the trees, as I made my way downstream from the weir pool of my little local river this week, the park bounded on two sides by housing estates, proving a magnet for runners, dog walkers and anglers alike. 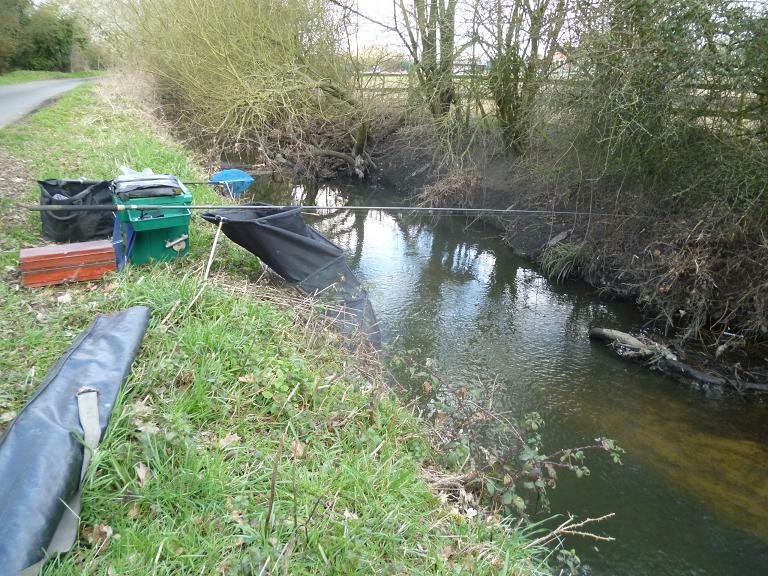 Today I was determined to find the roach that had eluded me last week and continued past the fast chub run of my previous session, looking for a slower pace in the river, choosing a spot on the straight of an S bend. This is not an easy swim to fish, having branches from the tree opposite hanging low over the water to half way across, needing a side catapult cast to reach the deeper water at it’s base. This was my first visit this season and I noticed that the shopping trolley feature of last year was now fully submerged, just to my side of middle ten yards downstream. 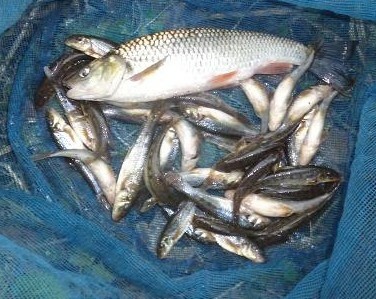 As I said, not an easy swim to fish, but nets of roach, skimmers and decent rudd make the occasional lost hook worthwhile. I set up a 3 No 4 short peacock waggler with a top rubber to fish as a stick float on my 12 foot Hardy Match, with an ABU 501 closed face reel completing the 35 year old rig. Liquidized bread was the feed and a 6 mm punch was used on the medium sliced white to provide the bait on a size 14 barbless. I followed a couple of hand sized balls of feed with a cast to the opposite bank and watched the float make it’s way down the flow, giving tell tale bobs of an interested fish. Straightening the bow of line from the downstream wind, resulted in a pull in the opposite direction and a hard fighting winter roach was darting across the river to be scooped into my net. Roach of this size were coming one a chuck and I was settling into a nice rhythm, when the sound of a chainsaw twenty feet away brought me back to the world of the park. Standing above me on the path, a bearded man in a da-glo vest was slicing into a fallen tree with the saw, spraying me with wood chippings. Seeing me he smiled and continued his labour, until a heavy branch was released to roll down the bank with a thump. A bizarre conversation took place as he scrambled down the bank to reduce the branch to log lengths, while I struck into another good roach and netted it. No he wasn’t a council worker, he was a volunteer, who had installed a wood burning stove at home and was busy feeding it from fallen trees in the various parks around town. Despite the noise and disturbance, I continued to catch roach, which amazed him, as he didn’t think there were any fish in there. Continued to catch that is, until he stood at the water’s edge peering down into the water saying that he couldn’t see any fish, his bright orange jacket standing out like a beacon. 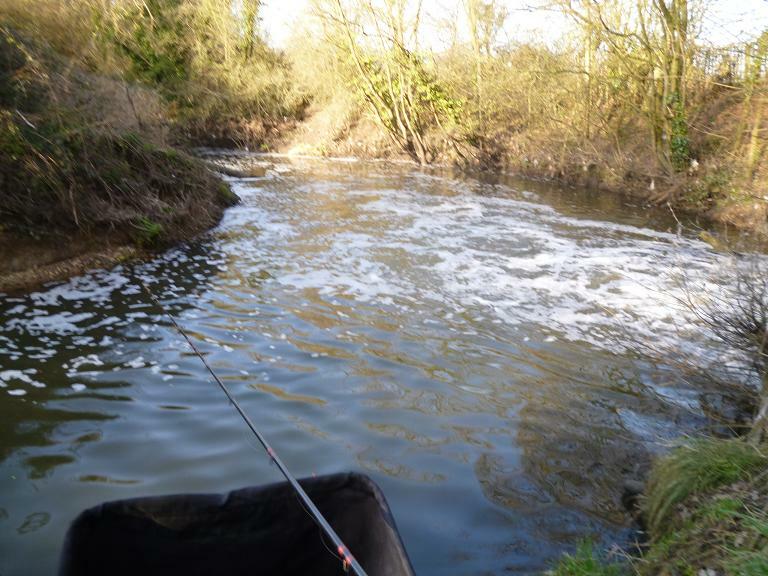 If this had been a match, I may have got the hump, but this was a sunny day in February and I already had outdone my expectations for the afternoon, so I fished on trotting further down the swim, until I snagged the sunken supermarket trolley and lost my hook, but thankfully, saved my float. At this he loaded up a wheel barrow with his saw and logs, retreating in the direction of the car park, returning ten minutes later on his way down to collect more logs. Yes I was still catching, holding up another roach, the fish now coming from further down the swim, despite my attempts to draw them back up with more feed. 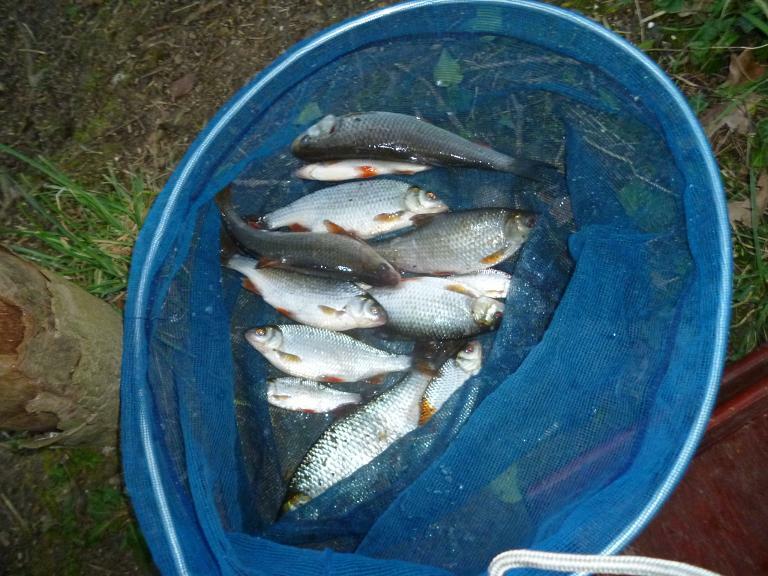 These fish I had to pull hard away from the sunken trolley and the size 14 hook only lost hold once on a smallish fish. When a mother and young daughter came down to the river twenty yards upstream and began feeding the ducks with slices of bread, causing a convoy of quacking mallards to rush past for a feed, I checked my watch and saw it was almost 4:30. Time to leave before I got stuck in the evening rush home. 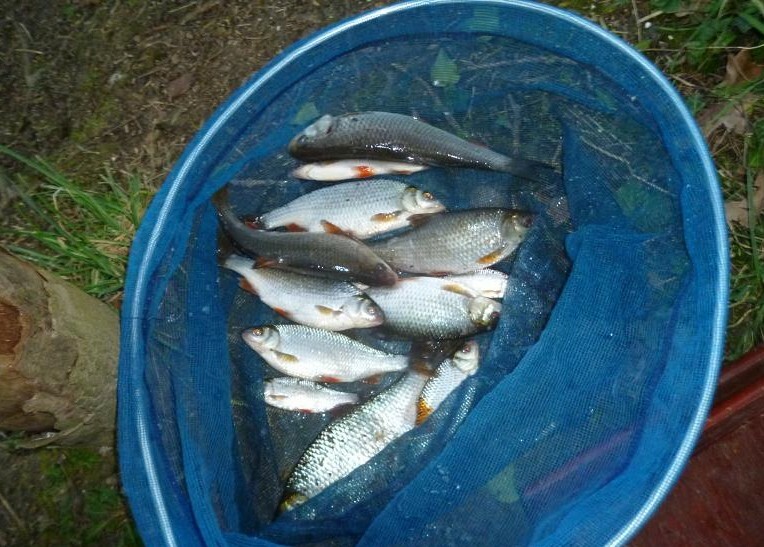 The sound from the net told me that I’d had a decent few hours fishing with some quality roach up to 8 oz, my scales indicating just over 6 lb of roach and one gudgeon.